This content covers all necessary stages in the production of the water tube boilers from the examination of the material, fabrication, welding inspection, dimensional inspection, NDE, hydrostatic testing to the final inspection, preservation and packing to despatch to the site. You need to take this point in account this article is written for a typical Water Tube Boiler and might not be complete for special cases. All Water Tube Boiler inspections and tests are carried out against the approved drawings, purchase order specifications, purchasers or company standards, and within the practices and rules of the country, state or province and any government decrees, laws, ordinance or regulation as may apply. The applicable codes and standard may be based other international standards such as BS 1113 and etc. This content is general and can be useful if even the design code is different from ASME Code. The list of documents normally is agreed in the Pre Inspection meeting which is hold several weeks before actual commencement of inspection work. The parties which are participated in this meeting are manufacture, purchaser and third party inspection agency representatives. This already explained in the Inspection and Test Plan for Water Tube Boiler article. The first actual inspection work in the Water Tube Boiler is raw materials inspection. Based the ASME Code providing material test reports for Water Tube Boiler plates is mandatory, for other components only the marking inspection will be enough. But if purchase order has mandated the MTR to be provided for all components such as tubes, nozzle pipes, fittings and etc. then the manufacture need to provide them as well. The original or authenticated copies of mill certificates for plates normally are available at manufacturer's premises. The third party inspector examines these certificates for compliance with specifications and where appropriate, drawings. Then the inspector witnesses the plate material identification on the certificates against plate marking. It is also necessary to check with Water Tube Boiler drawing datasheet, material list and other specification as appropriate. The transfer identification to cut off plates also needs to be checked. Visual inspection for surface finish and probable defects are done and dimensional compliance with specification need also to be controlled. When the Water Tube Boiler material inspection carried out and result was satisfactory or non-conformities closed by remedial action, then Water Tube Boiler manufacture will be authorised to start fabrication. The third party Inspector checks following points on Water Tube Boiler based on the inspection and test plan (ITP) which is already agreed between purchaser and Water Tube Boiler manufacture. The inspection scope is determined in ITP, some clients prefer to have stringent control and put the TPI inspector in more “hold points” in fabrication activities and some others may take lesser “hold points” and put TPI much more in the review document. This depend to the inspection budget which client assign for inspection, much more inspection will have much more costs and less risks and conversely less more inspection will have less costs but more risks. 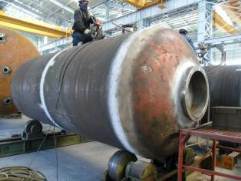 For more detail review Inspection and Test Plan for Water Tube Boiler article. There is draft ITP in this article which I believe it is the best practice for Water Tube Boiler inspection. Please note these components (Drums and Headers) in water tube boiler are similar to the pressure vessel, more detail information provided on Pressure Vessel Inspection Procedure article. Inspect cut plate visually and dimensionally and paying particular attention to material identification marks and identifies material to be used for the test plates. Dimensionally inspect weld fit up and visually examine edges of weld preparation to ensure that they are free from defects which may affect the welded seam. Verify/witness NDE of weld preparation if required by code. Visually inspect all drum/header longitudinal and circumferential weld seams and review radiograph and ultrasonic test reports. Dimensional check on attachments and compensation plates, nozzles etc. Verify completion of welding to a satisfactory standard and review records of post weld heat treatment. Verify that all weld test plates have been completed and properly identified. Internal and external final visual inspection. Check tubes and piping material identification. Witness tubes and integral pipes fit up before welding. Verify completion of welding to a satisfactory standard and that the specified NDE procedures have been completed and accepted. After depressurisation, boiler components have been drained and dried to meet specified requirements. Stamping of Inspection authority stamps, have been been carried out in approved area, as required by client/code. Stamps used are low stress type. Application of desiccant/preservative has been directed in client's specification. If third party inspector is not in the hold or witness point for these stages in the project ITP, then will review water tube boiler manufacture quality control report in his/her coming visit or in final inspection day. The third party inspector checks cleanliness and dryness of all components and recheck nozzles, support and bracket locations and orientations against assembly drawings. He/she also checks for deformation of tubes, attachments, flanges, etc. and report if necessary. Contents of marking are in accordance with approved drawing and specifications and authority stamped as required. Name plate is mounted on a bracket welded to a specified area of boiler, in accordance with the code requirement. The third party inspector controls spares, loose items, tools and accessories and make visual and dimensional inspection for materials, workmanship and quantity according to purchase order specification and packing list. Marking and/or Tag need to be checked for identification. Third party inspector provides Inspection Visit Report (IVR) after each visit as well as a final report summarising the activities carried out during the boiler production in accordance with the contract requirements and circulated within the time limits specified in the contract. The report is in the format required by the client and clearly indicates final acceptance or rejection of the water tube boiler. When required by the contract or purchase order a release note is issued by third party agency and given to the manufacturer when the water tube boiler have been finally accepted. Shipping marks and other markings and notificationof welding prohibited, etc.